With August just begun and talk of back-to-school shopping, we started thinking how fast this summer is flying by! I know we say this a lot on Share It Saturday, but this week was especially hard to choose features. We want to get busy and try them all! 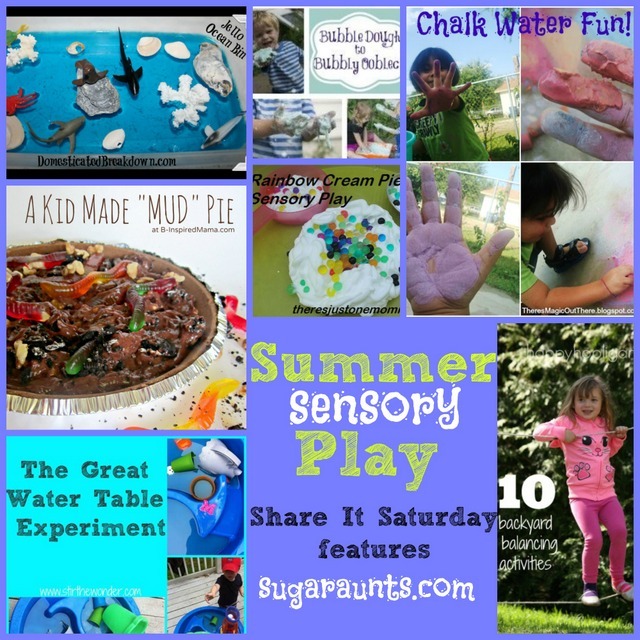 With the end of summer approaching, we thought this little round-up of summer sensory play activities could make August extra special. There's Magic Out There shares a messy chalk activity. We've played with wet chalk a few times, and this one is fun! There's Just One Mommy combined water beads and shaving cream. Sensory-tastic! Enchanted Homeschooling Mom had a messy sensory time in the backyard playing with bubbling oobleck. Get your hose ready for this one! Stir The Wonder used the water table to explore color, texture, temperature. And it's all outside! Happy Hooligans shares 10 backyard balancing activities exploring the kinesthetic sense. Domesticated Breakdown made a Jello sensory bin with an ocean theme. This sounds like so much fun to play with and explore textures. Enjoy Today, Play Hard, Get Messy!